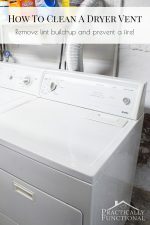 Home > Cleaning > Cleaning Tips > How To Clean A Top Loading Washing Machine With Vinegar And Bleach! 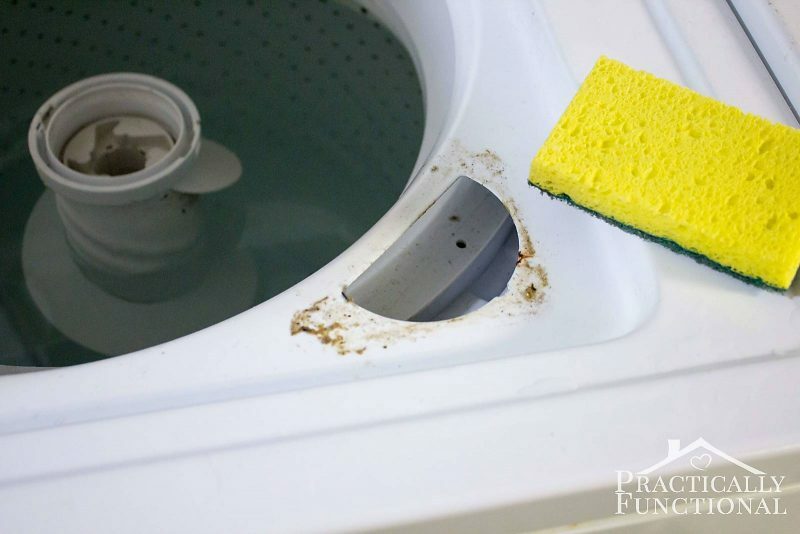 How to clean your washing machine – even if it’s not visibly dirty and grungy, this will help clean soap scum and mineral deposits in the pipes and hoses. 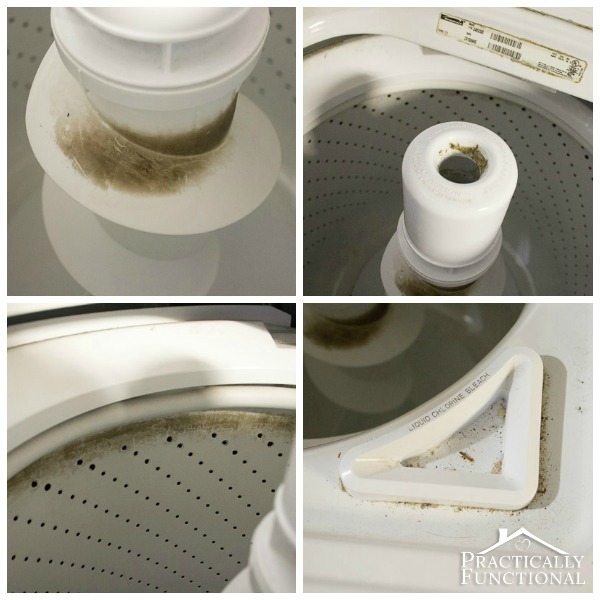 Did you know you need to clean your washing machine? Sounds counter-intuitive, right? Washing machines are what you use to clean your clothes. Don’t they just keep themselves clean every time you do a load of laundry? No they don’t! 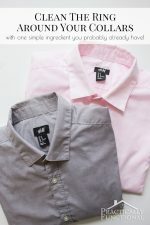 Washing machines get dirty just like anything else, so today I’m going to show you a simple, step by step tutorial on how to clean a washing machine with vinegar and bleach. It’s simple to do and it works wonders! a dirty washing machine, obv! Obviously that sucker needed a serious deep clean before our dirty laundry was going anywhere near it! Set your washing machine on the longest wash cycle and start it filling with hot water. HOT! Add four cups of bleach as the machine is filling (don’t add detergent or anything else, just the bleach). Let the machine fill all the way and agitate for a minute or two to mix the bleach in. After an hour, turn the machine back on again and let it completely run through its longest wash and spin cycle. As soon as the bleach cycle is done, immediately fill your washing machine again with hot water (still set on the longest wash cycle). 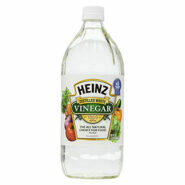 This time add four cups of distilled white vinegar as the machine is filling (again no detergent, just vinegar). Let the machine agitate again for a minute or two and then turn it off and let the vinegar mixture sit for an hour. This time, while the vinegar mixture is soaking for an hour, carefully dip your sponge in the vinegar water and clean the rest of the machine. The dispensers for fabric softener and bleach are usually removable. On my machine, the fabric softener dispenser at the top of the agitator just twisted right off, and the bleach dispenser in the corner popped up when I pulled gently. Just toss the plastic dispensers into your washing machine and let them sit in the vinegar mixture for a few minutes. 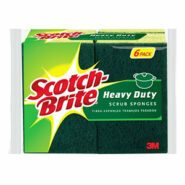 Wipe away any grunge on the machine itself, and then scrub the dispensers clean with your sponge. The vinegar wash cycle will help remove a lot of the grunge inside the barrel of the washing machine, but if you have really bad scummy icky grossness like I did (or if there is soap scum and build up above the water level inside the machine) scrub those areas with the sponge now, while the vinegar mixture sits. 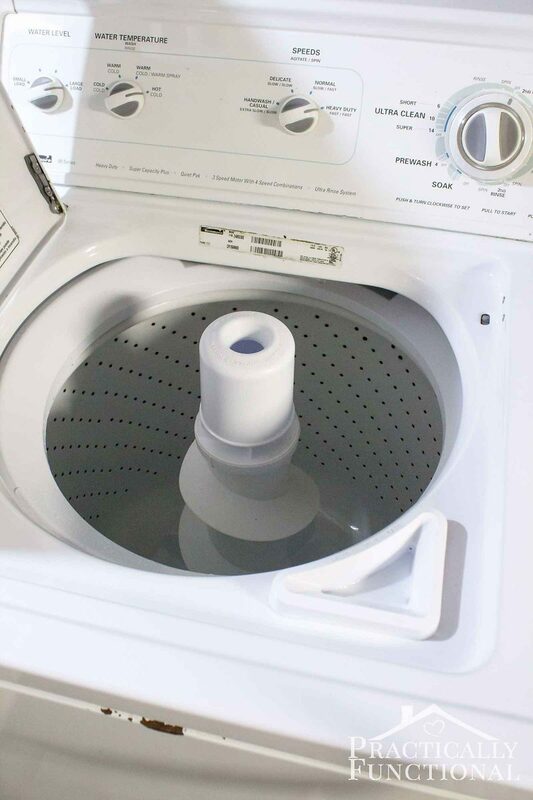 You can use the vinegar water to detail the exterior of your washer too; don’t forget the lid and the knobs! Once an hour has passed, turn the machine back on and let it run through its longest wash and spin cycle. And your washing machine should be good as new! 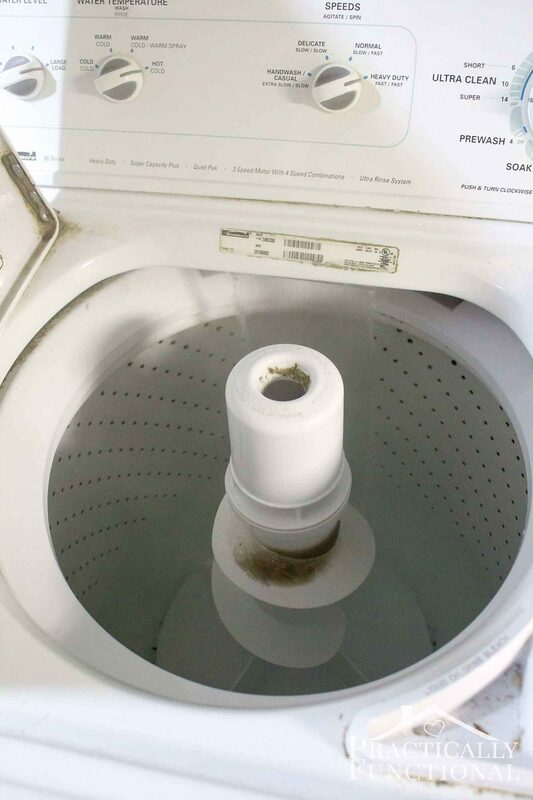 Besides cleaning inside the drum of your washing machine, the bleach and vinegar help clear out mineral deposits and soap scum in the pipes and hoses of your machine as well! So be sure to clean your washing machine with vinegar and bleach at least twice a year, and if, like us, you live in an area with hard water, aim for 3 or 4 times a year to keep everything running smoothly! 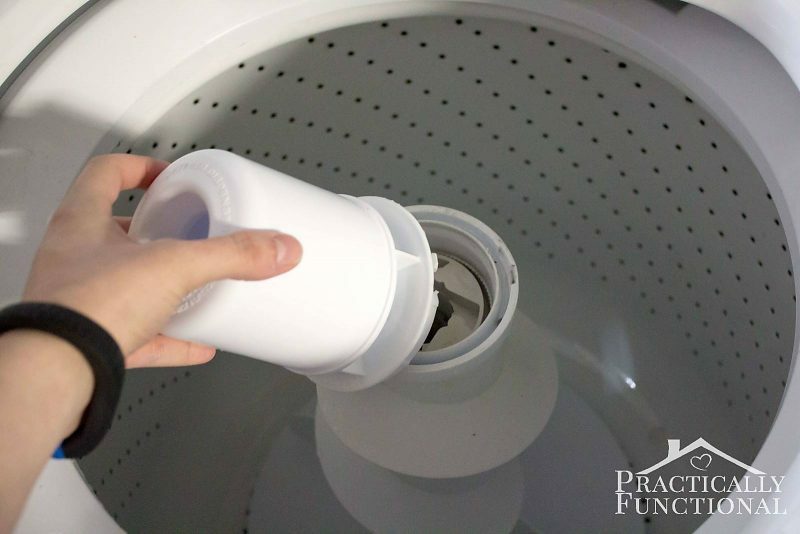 Also, remember to clean out your dryer vent about twice a year as well to prevent fire danger from lint buildup! « Ready For Spring Gardening? 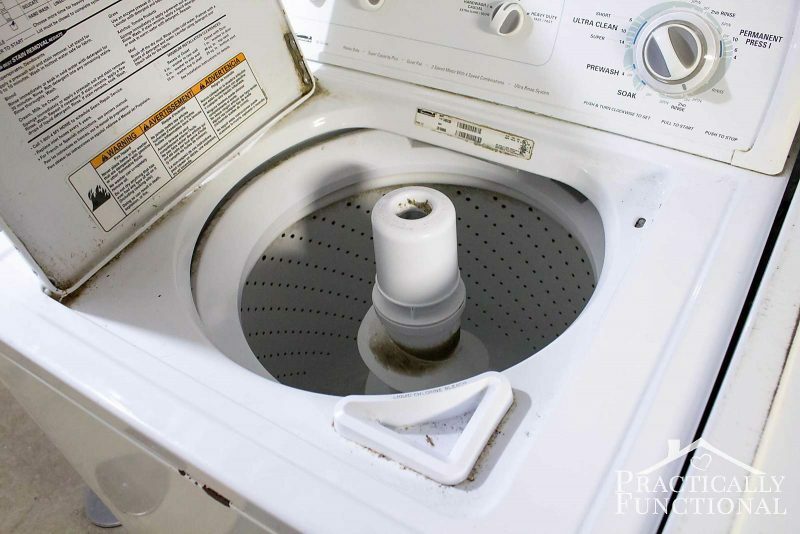 Have you ever tried cleaning underneath the rim top inside of the washer where the rubber runs in a circle at the top of the wash tub? Front load get a flashlight and stick head inside and look back and up at the rubber seal thing. You need to have some vinegar on a sponge and toothbrush to scrub the mold and soap off. Then run cycles to get the behind the drum gunk. Ammonia mixed with bleach is a crude form of Mustard Gas. Vinegar and bleach make toxic Chlorine Gas. Along the same line, never mix cleaning products like Lysol with bleach. Same thing could happen. In fact, avoid mixing bleach with anything. Use it alone. If you feel the need to make your place extra clean, apply another cleaning product after you have made sure yoi have cleaned away all the bleach. Chlorine poisoning can occur when you inhale chlorine. Chlorine reacts with water including the water in your lungs to form hydrochloric acid and hydrochlorous acid. Both of these substances are extremely poisonous. Eek, I need to clean ours STAT … can’t wait to follow your tutorial! I was seriously looking at my washing machine yesterday thinking… how am I supposed to clean this guck? Haha, perfect timing! Good luck with it! I am wondering, is this possible with a locking washer? We have a top loading washer, but the water does not turn on until the lid is closed and then locks. You have to pause the wash to open the lid. Would I allow to fill halfway then add the bleach or vinegar, then resume to finish? Yep, that would work perfectly! Fill it halfway, then lift the lid and add the bleach, then shut the lid and let it finish filling, and let it start agitating for a minute, then just unlock and lift the lid again to let it sit for an hour. And do the same thing on the vinegar cycle. That won’t necessarily work. I tried soaking my youngest daughter’s baby clothes because she had bad reflux and really messed them up. I left the lid up and the water just drained out. Also, many of the new top loading HE machines have a weight sensor and fill with water by the weight of the load so if there aren’t any clothes in there, it’s not going to fill. Hmm, in my older model top loader it never drained as long as I left the lid up. But maybe there’s some sort of timer built in where it drains if it thinks you forgot about it or something. 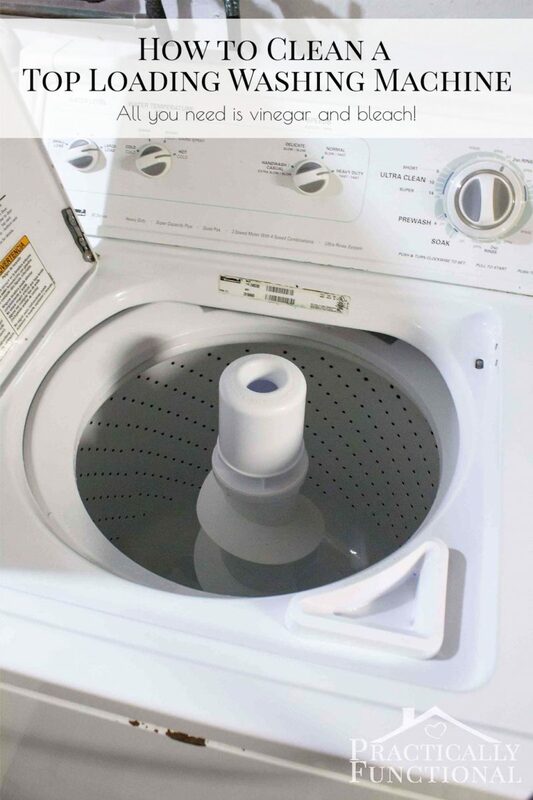 Is there a “soak” setting on the newer machines that allows you to fill and soak the clothes? My older model has that setting where it just allows it to fill and sit, but I don’t know for the newer ones. Sorry I can’t be of more help! On my washer, you just pull the knob out or in, which ever way yours works…that way the cycle is stopped and the timer is not running.. The lock can probably be bypassed so you can have the lid open throughout the cycle. 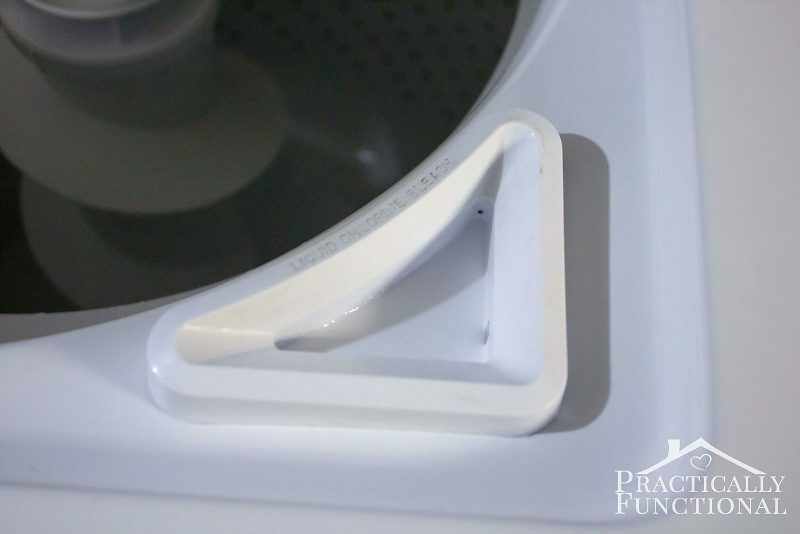 Stick a magnet to the front of the washer right next to the gizmo that pops out to do the locking. (There’s a magnet inside the lid at this spot, so you’re tricking the washer into thinking the lid is closed.) With Whirlpool washers, you also have to limit the reach of the gizmo. I hold the toothbrush I’ve used to scrub stains against the magnet so the gizmo pops out only 3/4 inch. I always do my laundry this way so I can be sure of a thorough rinse. 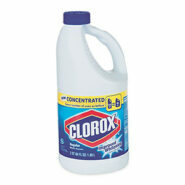 Wow it’s amazing what a little bleach, clorox, and sponge can do. I think I need to be putting this on my spring cleaning to do list. I used this method to clean my washer a few years ago. 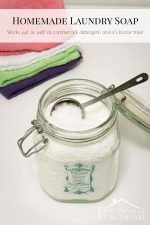 Since then, I’ve only used powder detergent (mostly homemade) as well as homemade fabric softener (made with white distilled vinegar). It helps keep it clean. Liquid detergents leave a lot more residue. Good to know Mary, thanks! Bleach is useful for stain removal, but be very careful what you mix it with as you can produce TOXIC FUMES. Vinegar and bleach should never be mixed together. Very true! That’s what you have to run two separate wash loads to clean your machine this way! I didn’t remove the lid, I just took a sponge and squeezed soapy water all around the hinges and let it sit while I cleaned the rest of the washer. Then I came back a few minutes later and the gunk pretty much just wiped away with the sponge and rinsed down the drain as I poured more clean water over the hinges. Also, if you have a spray bottle, after the gunk has soaked for a few minutes, you can use the water pressure from the spray bottle to wash it away anywhere the sponge can’t reach! Any ideas on how to do this for the coin operated machine at my apartment building? The machine stinks and the landlady won’t take care of it. It is top loading- the problem is that the only way to stop it is by opening the machine and no cycles can be repeated or started again- in other words it has to be run all the way through. Ours is the same way; if the lid is shut it runs, no matter what, and the only way to stop it is to open the lid. You can just leave the lid open while it soaks, that’s what I did! Maybe leave a sign if it’s in a public laundry room so no one accidentally shuts the lid and starts the cycle too soon. Another way is, usually there is a tiny plastic part that sticks out of the lid that, when you close the lid, goes into a hole and pushes a button to let the machine know to start up. If you clip a clothespin around that plastic stick, you can close the lid but the stick part won’t go far enough into the hole to push the button. That way it mostly looks like the lid is closed, it just isn’t closed all the way. But I would definitely leave a note either way to make sure no one accidentally starts it up too soon and wastes the cycle, and good luck! I have a concentrated bleach should I use only 2 cups of bleach? No need! Clorox’s new “concentrated” bleach is only slightly stronger than their original stuff, and the Concentrated version is what I used. I think their bleach with “Concentrated” on the label is pretty much the standard now; I haven’t seen the regular stuff in stores recently. If you’re worried about it, feel free to use less, but I would use 3 cups instead of 4 cups. Their concentrated formula is definitely not twice as strong as the regular stuff! Thank you, thank you! I tried cleaning my washer with an over the counter product that was dangerous if it touched the skin and it did nothing! My washer looks brand new now that I used the bleach and vinegar. The mildew smell has disappeared! Awesome Kim, I am so glad to hear it worked for you! That mildew smell is the worst, so I’m glad it’s gone!!! This is something that I have been putting off for the longest time. I came across this on Pinterest and you’ve inspired me to get my washer clean! Thanks for sharing! in regard to the question of how to clean a top loading washer around the hinges of the lid, I found that the inexpensive foam paint brushes work well. They will scrunch down to get into the areas you can’t reach with a regular sponge. 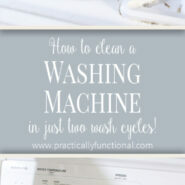 I’ve been wondering how to clean my washer and knew there had to be an answer on Pinterest! Thanks! Great idea for the hinges Claudia! A scientist here in Japan found that the water inside of most washing machines is dirtier than what you find in many dirty rivers. That has led to many people here doing what you are suggesting, regularly cleaning their washing machines. Many Japanese washing machines now come with a cleaning cycle that lasts for about 10 hours and we can purchase special bleaches and disinfectants for this purpose. I even heard of one case of a child’s skin disorder of some sort being cured after they washed the inside of the washing machine. 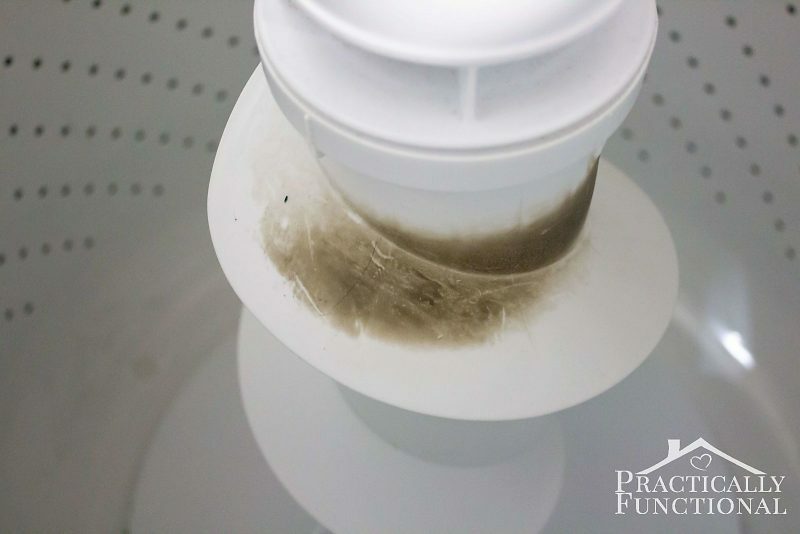 Quite a bit of mold can be found inside the unseen parts of a washing machine… That’s why we have to regularly wash them. doing this today…the machine we inherited when we moved in is far from clean – I can’t wait to see how this works!! When you clean the dispensers do you have to rinse and dry them before putting them back on or can they be put back on while wet? I would rinse them out really well, but they can be wet when you put them back! SO…how would this work on those washing machines that go by weight (of clothes, etc) before deciding how much water goes in? NO water would go in to help do this…HELP!!! Hmm, good question Melissa! I don’t have any experience with those types of machines. Is there any sort of setting on the machine for cleaning the machine, or something that will allow you to just run water through the machine without any clothes in it? So glad it worked for you! We just bought a house in March and the previous owner left us this mess too; I’m really glad it was so easy to clean! Thank you for the tutorial. 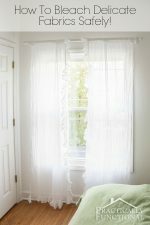 I bought a house recently and stumbled across your site about cleaning the washer? The previous owners left the washer and dryer here and the property had been a rental for them so I knew there was no maintaining done. I did the washer last evening per your instructions and OMG was this filthy. It’s clean now this will be done a couple times a year!! Thank You Again!! I had to smile because your washer is the exact same as mine. I have had it for almost 20 years and it still works great but it needed a refreshing bath! I’m in the process of cleaning it now per your instructions. Thanks for posting this! Does this work with cold water. I don’t have hot water hooked up to my washer. I think it will work! The hot water just helps to dissolve the scum and gunk better, but it should work just fine with cold. I had the same question, we also have only cold water going in. It desperately needs a clean though, so will give it a shot and let you know how it goes! Just in time! I had never thought to wash my washing machine? Just this morning I noticed that there was a little mold in the softener dispenser, which we hardly ever use. I followed your advice and I am so glad I did! It was horrible in there . I can’t believe I have been washing our clothes in that! So glad to hear it worked for you! I loved this on cleaning the washer! Only makes sense to get dirty as you make others clean! Better yet, have all blogs printable or that blogs print name would be given under the title would be given and that print name would be entered in a place on a site set up to print all blogs and just the blogs writing would be printed not the side ads/whatnot? As when recipes are printed, there could give the individual choice of whether to print pictures, place for their own notes, blogs, etc. LOL Looking back on this what a first blog! Many Thanks! What if you isr cold water only? Would it work the same? A few people asked that in the comments above too; I believe it will still work, it’s just that hot water is better at dissolving the grease and grime than cold water is. You can always heat water on the stove and add it if you’re worried about it, but that’s a lot of extra work! I always run a cycle with water only to flush out residual bleach from hoses. Over time bleach will erode rubber hoses. Can you tell me if it would be safe to use that much bleach to clean the washer, knowing we have a septic system? I have heard that bleach messes with the organisms in the septic tank. Hi! I am doing this as I type. I am a clean freak and did the normal cleaning routine when we bought it used. I am so happy to have found a deep clean solution. My boyfriend thinks I am crazy for washing the washing machine. Boy wait till he sees the before and after pictures! I am excited to do laundry after it’s clean. I bet my towels with smell much better. I am cleaning my Moms washer later today. Thank you so much!! Good luck with it, I hope it works as well for you as it did for us! I have a locking lid top loader. I let it fill up then I paused it to add the bleach. I started it up again and let it agitate a few minutes. Then paused it again so it could sit for an hour. Well after 12 minutes it started draining the water. Any way to prevent that? I ended up starting it again and just letting it run its load. Then I did the same thing with vinegar and while I had it paused and open I cleaned the rims, etc and again after 12 minutes it started draining and drained the whole thing. Do you have a “soak” setting on your machine? It is probably draining itself just as a precaution; maybe it thinks you forgot about it or something. But if there’s a “soak” cycle you could try using that instead! I have one of the newer high efficiency (top loading) washers and, if yours is like mine, it has a mind of its own. Mine even locks the door until either it has finished all its cycles or I cancel the whole process. “Hey, no peeking, lady.” I follow the cleaning instructions in the owners manual and hope for the best. Awesome advice! The rental house we live in has a filthy washer and I’m thrilled to try this. I’m also going to try your homemade laundry soap. Thank you for all the valuable information. mixing vinegar and bleach releases chlorine gas, which was used in gas warfare in WWI. I wouldn’t do it, especially in an enclosed space. Yes, that’s why you use the two separately. The instructions in the post are very clear that the first cycle you run contains bleach, and the second cycle contains vinegar. You don’t mix them together.